The Ricoh GR Digital IV is a high-end, premium priced compact camera that, superficially at least, appears to be little more than a re-badged version of 2009's GR Digital III. Like its predecessor, the Ricoh GR Digital IV features a 10-megapixel 1/1.7-inch CCD and a fixed focal length 28mm (effective) f/1.9 lens. It retains the same body design, too, complete with accessory hotshoe, pop-up flash and well considered control layout. HD video shooting continues to be noticeable by its absence - the camera can just shoot VGA footage at 30fps - but we imagine that its target owner is likely to be largely unfazed by this. This is a camera for people who need a photography tool rather than a toy. There's certainly a distinct lack of 'extras', with new features introduced by the Ricoh GR Digital IV being focused firmly in the areas of shooting performance and image quality. Take the new Hybrid AF system, for instance. This sees an external 190 AF-point sensor working in parallel with the conventional CCD contrast detection system. The result is said to be an autofocus performance that's twice as fast as the Ricoh GR Digital III's. Sensor-shift stabilisation and a new GR ENGINE IV image processor promise enhanced image quality, while a higher resolution 1.23 million dot Sony LCD monitor improves upon the GR III's 920,000 dot panel and makes images look glorious. Further tweaks on the Ricoh GR Digital IV include a more refined electronic level that detects if the camera's titled forwards or backwards, in addition to left or right, plus new Auto Bracket options for dynamic range and contrast. Two new Image Setting options for Bleach Bypass and Positive Film complete the line-up of major changes. 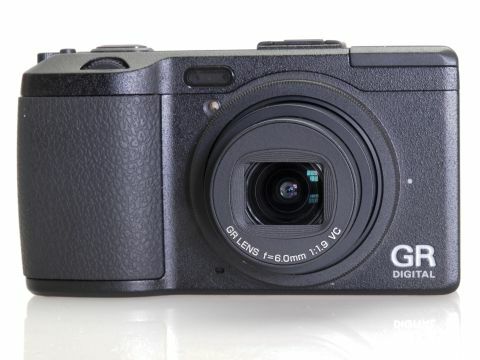 Priced at £449.99 in the UK and $599.99 in the US, the Ricoh GR Digital IV's rivals include the Fuji FinePix X10 and the Olympus XZ-1.